Christ Church on O’Connell Street looks like an ordinary office block in the heart of commercial block. But behind the 1950s façade is a church used by the united Presbyterian and Methodist congregation, bringing together two separate congregations since the early 1970s. All that indicates that there is more inside is the name above the door. But until the 1950s there was a garden in front of what was a fine Gothic revival Methodist church. The Methodist story goes back to 1739 and John Wesley’s preaching. Methodism was introduced to Limerick City by Robert Swindells, who preached his first sermon in the Parade in 1748 or 1749. The first conference of the Irish Methodists was held in Limerick in 1752, and it was chaired by John Wesley. The Methodists in Limerick first rented the old church of Saint Francis’s Abbey near the Sandmall. They then built a new chapel ‘a handsome edifice near the city courthouse’ on Quay Lane (now Bridge Street). This was sold when Christ Church on George’s Street (now O’Connell Street) was built in 1812-1813. However, a schism divided Methodism with a rising demand for sacramental life in Methodist chapels. A vocal minority protested that such a move would separate the Methodist societies from the Church of Ireland. In 1816, the Methodist Conference approved the consolidation of the Methodists into a more formal Church and the decision caused division, with one-third seceding and forming the Primitive Wesleyan Methodist Society to preserve their links with the Anglicans. The newly built-chapel on George’s Street was retained by the majority group, who were known as the Wesleyan Methodists. It was remodelled by Robert Fogerty in 1879 and reopened on 7 September 1879. Meanwhile, the smaller minority Primitive Methodists built their own chapel, first known as the Independent Chapel and later as Central Hall, in Bedford Row in 1821. The new church was built of cut stone, in the Gothic style, with an iron balustrade and handsome entrance. David Lee and Debbie Jacobs, in James Pain, architect (2005) suggest that the church was designed by the Limerick-based architect brothers James and George Richard Pain, although there is no compelling stylistic evidence to support this. Beside it was the Independent Chapel on Bedford Row which later later moved to Hartstonge Street, where Ove Arup now has its offices. Limerick had two Methodist churches until the Central Hall in Bedford Row closed in 1920 and the Methodist community there united with the church in O’Connell Street. The former chapel was re-opened by Paul Barnard as the Grand Central Cinema in November 1922 and was later known as Savoy 2. A three-bay three-storey cinema, façade was built in the Art Deco style in early 1930s to the front the former Methodist chapel. A shop front was inserted on the ground floor in 1973, and access to the cinema was from one side of the building and up two flights of stairs. Savoy 2 closed in 2004 and the old Art Deco façade was demolished in 2007. I understand part of the original church frontage is encased in a new modern shop on Bedford Row. Meanwhile, the Methodist Church on O’Connell Street was substantially rebuilt in 1938. The congregation had dwindled in numbers, and an office block was built in the garden in front of the church to create a rental space and to maximise the commercial use of the street frontage. The building erected in 1938 is a terraced, six-bay three-storey rendered building in the Art Deco style, distinguished by two shopfronts at ground floor level, flanking a centrally-placed door opening, with vertically emphasised window bays to first and second floor and narrow window piers giving a staccato rhythm to the façade. This is a fine, yet restrained example of Art Deco architecture that is relatively rare in Limerick. A door opening to the side with a canopy gives access to Christ Church. This door opening has splayed bronze handrails and terrazzo steps, and the name above the door is all that identified this as a church for the passesr-by on O’Connell Street. The church is reached through a long corridor lined with memorials brought here from the former Presbyterian Church on Henry Street when the two congregations united in 1978. As part of the 200th anniversary celebrations at Christ Church, a genealogy and family History day took place in the church in 2013. Limerick Methodist registers date from 1842, and the Presbyterian registers date from 1829. They include the records of the Methodist mission in Kilrush, Co Clare (1847-1901), and the Presbyterian congregation in Killarney, Co Kerry (1879-1907). The Methodist churches in Kilkee and Kilrush, Co Clare, and in Tarbert, Co Kerry, once formed the West Clare Mission. Two years ago, Christ Church received a facelift with funding from Limerick City of Culture 2014. But it is still possible to walk by this building without noticing that behind the discreet façade there is a church with such an interesting story. Corrected 8 June 2017, with acknowledgments to Liam Irwin. As I was walking around the churchyard at Saint Mary’s Cathedral, Limerick, yesterday afternoon [7 June 2017], I came across what must be one of the most unusual graves. The grave of Prince Milo of Montenegro faces the great west door of the cathedral, and lies beside the boundary wall, looking out onto the banks of the River Shannon. Prince Milo Petrović-Njegoš (1889-1978) was a prince of Montenegro and was a direct descendant of Radul Petrović, brother of Danilo I (1670-1735), the first Vladika or Prince-Bishop of Montenegro from 1696. Montenegro achievbed de facto independence from the Ottoman Empire in 1711 but only received formal international recognition as an independent principality in 1878. In 1889, Czar Alexander III said Prince Nikola of Montenegro was Russia's ‘sole sincere and true friend’ in the Balkans. Prince Milo was born later that year in Njeguši on 3 October 1889. He studied at the Military Academy in St Petersburg, Russia, and there he became a personal friend of Czar Nicholas II and Czarina Alexandra. Montenegro declared itself an independent kingdom in 1910. During World War I, Prince Milo was the commander of the Lovćen Brigade, and led his division into Albania in 1916. After World War I, the king was deposed and Montenegro was forced into the newly-formed Yugoslavia. Prince Milo left Montenegro in 1919, and for more than half a century he moved around the world as an exile, engaged in a diplomatic campaign to secure the restoration of recognition of Montenegro as a sovereign, independent state. After some years in exile in Italy, Mexico, Shanghai and England, Prince Milo pursued Helena Grace Smith from Haworth in Yorkshire to the US, and they were married in Santa Barbara, California on 3 September 1927. A year later, their only child Milena was born in Los Angeles, named after the last Queen of Montenegro. But Milo abandoned his young family the following year, returned to England and settled in London, where he ran an antiques shop with the half-Irish Doreen Powell before moving to Dublin, where he set up another antiques shop. Meanwhile, his cousin, Prince Michael Petrović-Njegoš, inherited the royal claims of his predecessors in 1929 while he was living in exile in France. He survived arrest and internment on Hitler’s orders for refusing to head up a puppet state in Montenegro. At the outbreak of World War II, Prince Milo was at the centre of a society scandal in Ireland when he eloped with Gladys (McClintock), wife of Henry Arthur Bruen of Oak Park in Carlow. She was from Rathvinden House, in Leighlinbridge, Co Carlow, and the Bruens had been married for 26 years. Milo and Gladys moved into a house she owned in Errisbeg, near Roundstone in Connemara. There in the 1960s, they became friends with David Allen, who ran Mullen’s auction house in Bray for many years, and his wife Noreen, who ran Clifden Antiques. When Gladys Bruen died in 1969, however, she was buried in the Bruen mausoleum in Carlow and Prince Milo stayed on in the house in Errisbeg, where he became a virtual recluse. There, he continued to maintain his friendship with David Allen, who agreed to buy the house and land, allowing the prince to continue living there until he died. For most of his life, Prince Milo was estranged from his only daughter, Milena. But as an adult she renewed her acquaintances with him after 39 years and visited him in Ireland several times. He died in Barrington’s Hospital, Limerick, on 22 November 1978, and was buried in a small plot he had bought by in the churchyard at Saint Mary’s Cathedral. His daughter Milena attended the funeral. The modest and unassuming stone marking his grave is fading and in yesterday’s rain it was almost impossible to read the wording. Recently, his Connemara home, now known as the Prince’s Cottage, was on the market with an asking price of €470,000. Meanwhile, Princess Milena, a retired school principal, continued to live in California with her husband Malcolm Thompson. Like her father, she hoped to see Montenegro become an independent country once again. In 2001, she published her biography of her father, My Father, the Prince. But the story does not end there, for there is a strange connection with Montenegro that links the humble gravestone at Saint Mary’s Cathedral in Limerick with an ornate casket Christ Church Cathedral in Dublin. 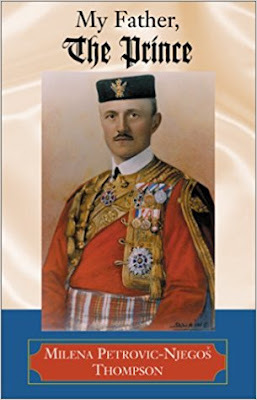 Marko Zekov Popović was the Hereditary Royal Standard Bearer of Montenegro, a member of the the Montenegrin National Committee, and the author of Where is Montenegro? The Martyrdom of a Small Nation (1926). When Popović died in London on 26 October 1934, he was cremated and his ashes were brought to Dublin, where they were put in an ornate casket on a shelf in the south aisle of Christ Church Cathedral, with an accompanying plaque. The urn was probably placed there by Prince Milo Petrović or his daughter Milena Thompson. Prince Milena died in Los Angeles on 14 February 2005. In the following year, an independence referendum was held on 21 May 2006, and Montenegro declared independence on 3 June 2006. When Donald Trump brusquely shoved aside the Prime Minister of Montenegro, Dusko Markovic, at the NATO summit in Brussels last month it was yet another rude rebuff for the tiny Adriatic state, almost a century after the Western allies had forced it to be subsumed into the greater Kingdom of the Southern Slavs or Yugoslavia. Once again, Putin must have been pleased with Trump’s rude behaviour. Montenegro’s government accuses Russian intelligence of plotting a failed coup last October while Moscow accuses Markovic and his government of being a mafia clique. As the Econmoist reported, the meeting in Brussels was supposed to be a celebratory preparation for Montenegro’s entry into the western alliance this week (5 June 2017). But perhaps the Montenegrins will have the last laugh when Trump receives what may yet be an imminent heave-to before his term of office comes to an end.